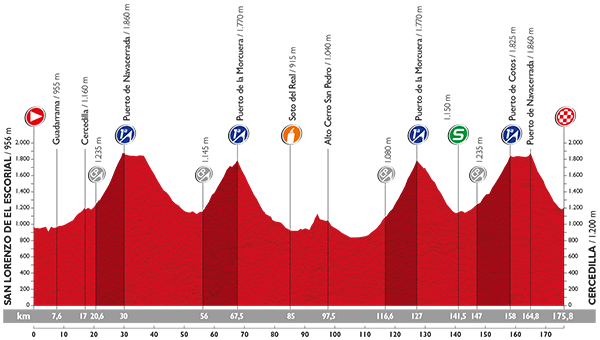 With just six seconds separating the top two at the start of the stage and four cat 1 climbs to tackle, it was always going to be a spicy Saturday at the Vuelta. 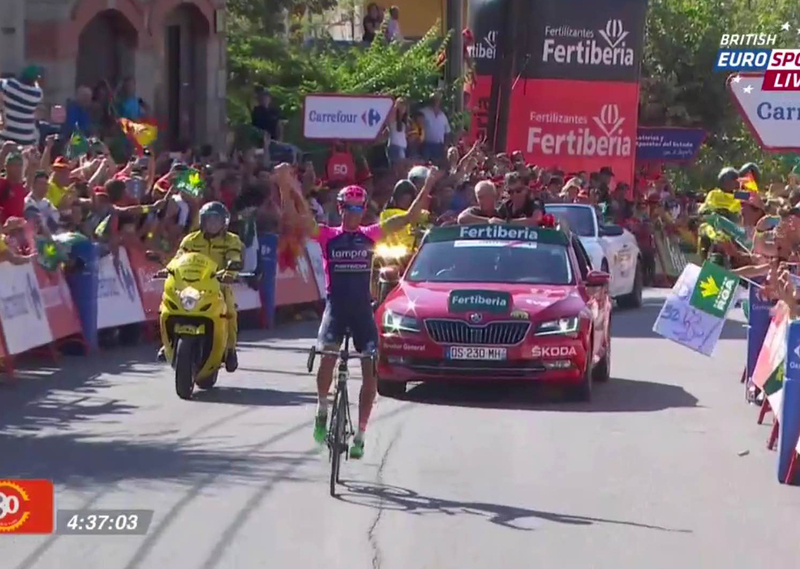 The stage win belonged to Lampre-Merida’s Ruben Plaza for a staggering 112km solo ride of sheer guts and determination. The GC was well and truly shaken up on the penultimate climb with the jubilation going to Astana and Fabio Aru who snatched the red jersey from the Giant shoulders of Tom Dumoulin with a clinical display of tactical verve. It started off quietly with two smallish breaks going away and eventually forming an unwieldy group of about 30 including, tactically, the Astana pair of Luis Leon Sanchez and Andrey Zeits. Plaza attacked on the second climb and the other breakaway riders were unable to close the gap as he held on to win from Jose Gonçalves (Caja Rural) and Alessandro De Marchi (BMC). Dumoulin knew what was in store for him, saying before the stage, “I am nervous. Maybe you can’t see it but it’s because I have my poker face. It’s going to be very hard, there will be a lot of attacks.” He was already isolated from his Giant teammates as the peloton approached the Puerto de la Morcuera for the second time. By contrast, Aru was surrounded by a sea of turquoise and they made it count as first Dario Cataldo and then Mikel Landa set a blistering pace that shattered the peloton. Alejandro Valverde was dropped, the red jersey wobbled and was distanced at first but then made his way back to form a select eight-man group. With the summit in sight Aru took off with Nairo Quintana and Rafal Majka in tow and eventually Esteban Chaves, Joaquim Rodriguez and Landa all bridged across. Big Tom kept his head and dug deep coming back to within nine seconds on the descent, but it wasn’t to be. With Zeits and Sanchez dropping back from the break to join forces with Aru and Landa on the final climb, Astana had played their cards perfectly and somewhere on Puerto de Cotos Dumoulin’s shoulders sagged just a little as the gap grew and the Vuelta slipped away from him. Podium places and jerseys were now up for grabs and everyone knew it. Quintana jumped away near the summit with birthday boy Majka on his wheel and they quickly built a gap on the by now jubilant Astana group. With the looming presence of Valverde banished and the green points firmly in his grasp Purito went into action with some menace. As they all rolled over the line there was an agonising wait of nearly four minutes for Dumoulin. At the end of the day Aru had moved into the red jersey, Rodriguez had moved into second with Majka stepping up to third, while Dumoulin had tumbled to sixth. We have been lured into quoting the oft-misused word ‘epic’ quite a lot this Vuelta, often on stages that haven’t quite lived up to the billing. But we’re certain that the stage victory by our rider of the day more than deserves the phrase ‘a ride of epic proportions’. Ruben Plaza only joined Lampre-Merida at the start of the year as climbing support for Rui Costa. But, WOW, what a grand tour season he has produced. He won stage 16 at the Tour de France with a solo attack in the last 25km, holding off a rampaging Peter Sagan (Tinkoff-Saxo) on that sketchy descent into Gap. When he left the huge break of the day with 115km and three climbs still to ride, no one gave him a snowball’s chance in hell of staying away to the finish. As the climbs came and went and his gap to the chasers, though wavering, never went under a minute the belief began to grow. It was clearly hard work on the final climb and all the way across the morale-sapping flat plateau at the top, but that must have been more than compensated for by the sheer relief of the swoop downhill and the joyful ride to the finish. Who didn’t cheer out loud as he came to the finish line with enough energy to cast his gloves to the spectators and hold his arms aloft to take a simply outstanding victory? 1. Tears of joy and despair. I found myself in conversation with fellow VeloVoice Ant last night discussing the ‘romance of cycling’ and the passion this sport of ours invokes. It struck me again as we witnessed those extremes of emotions two young riders experienced today. The agony of watching Tom Dumoulin riding those last kilometres knowing that his Vuelta dream was shattered, the sadness of listening to him post-race, so shocked and stunned that I just wanted to reach out and hug him. In the opposite corner, witnessing the sheer delight of Fabio Aru embracing his teammates as he came over the line and his tears of joy knowing the red jersey was his. We all have favourite – and not-so-favourite – teams and riders but at the end of a stage when I’m revelling in the drama it’s the romance of the sport I love that matters most – and I hope never to lose it. 2. Teams and tactics. It was tactics and team selection that made the difference today. Astana had a team built to support their leader in the mountains, and they had the manpower to be able to plan to send riders in the break who could fall back and support later in the stage. They played their card perfectly and you have to admire them for that. Giant-Alpecin came with a team to support John Degenkolb in his quest for stage wins. No one could have imagined that Tom Dumoulin would perform so brilliantly in the mountains let alone be in with in a chance of the red jersey. Outgunned in almost every mountain stage, the Giants and their leader laid it all on the line to produce one of the most exciting finishes to a grand tour we’ve seen for a while. #Chapeau to both I say. 3. #OuEstLePetit. FDJ’s Kenny Elissonde has been a VeloVoices favourite for a while and we’ve been willing him on this Vuelta. Everyday the call ‘Where is Kenny?’ goes out and today visions of his 2013 victory atop the Angliru flared bright as we saw him hit the break of day. Winning glory was not to be, but he did come home in eighth position and barring a freak accident tomorrow looks set for a finish in the top 20. It’s been a thrill to see him attacking and climbing well in the last couple of weeks. He’s terrier-like on that Lapierre bike and we hope to see more feistiness in 2016. Points leader: Joaquim Rodriguez (Katusha). King of the Mountains leader: Omar Fraile (Caja Rural). Combined classification leader: Joaquim Rodriguez (Katusha).